Click to print & share this flyer. 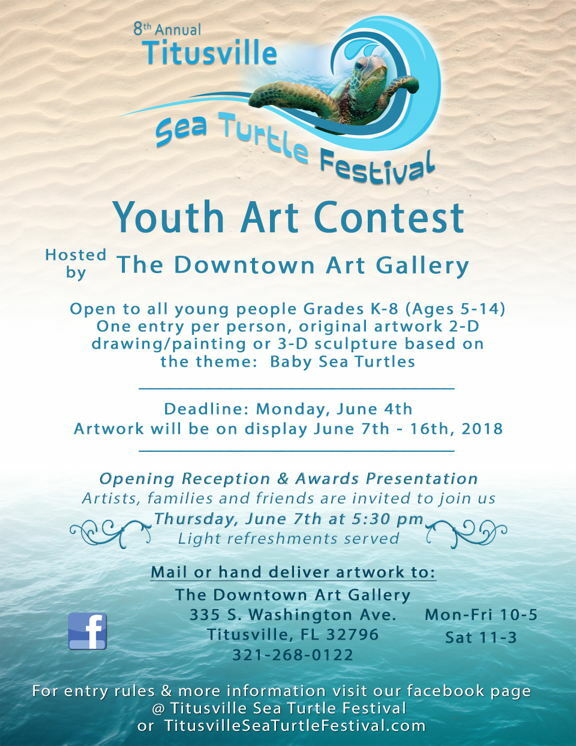 All young people grades K-8 (Ages 5-14) are invited to create a sea turtle inspired work of art for the Titusville Sea Turtle Festival's Youth Art Competition. The theme is "Baby Sea Turtles." Hand deliver or mail artwork to The Downtown Art Gallery on or before Monday, June 4th by 5:00pm. 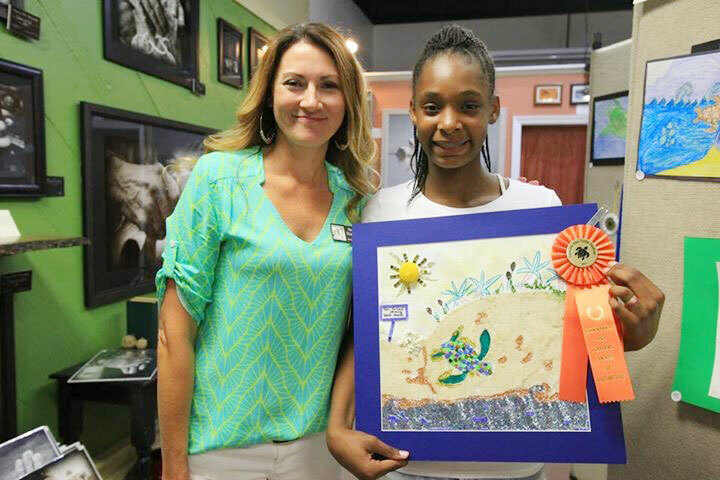 The Downtown Art Gallery is pleased to announce the winners of the 7th Annual Titusville Sea Turtle Festival Youth Art Competition. Artwork was on display at the Downtown Art Gallery June 9-17, 2017. Of the 92 terrific entries, winners were selected on creativity, composition and technique with the theme "Protecting Sea Turtle Habitat" by a jury of two judges with extensive art backgrounds. Best Depiction of Theme Award for all age groups went to Brianna Fontaine for her sculpture titled "Do Not Litter. Save the Sea Turtles." Judges comments, "powerful statement on trash in our modern day environment." The Downtown Art Gallery awarded one young artist the Award of Destinction for her use of materials with different textures, sky, sun, sand, beach, eggs, turtle, captures the essence of sea turtle life on our beautiful Playalinda Beach/Canaveral National Seashore. All weekend festival goers were asked to vote on their favorite in all age groups for the People's Choice Award. Votes were tallied and Liam Earle was presented with this award. Congratulations to all the winners and participants who entered! All of the winners received ribbons and Canaveral National Seashore backpacks packed full of prizes donated by generous area businesses. pictured with Heidi Thamert of The Downtown Art Gallery.